The six-time Mr. Olympia winner walks the line between monstrous size and aesthetic proportions. Here’s how he does it. 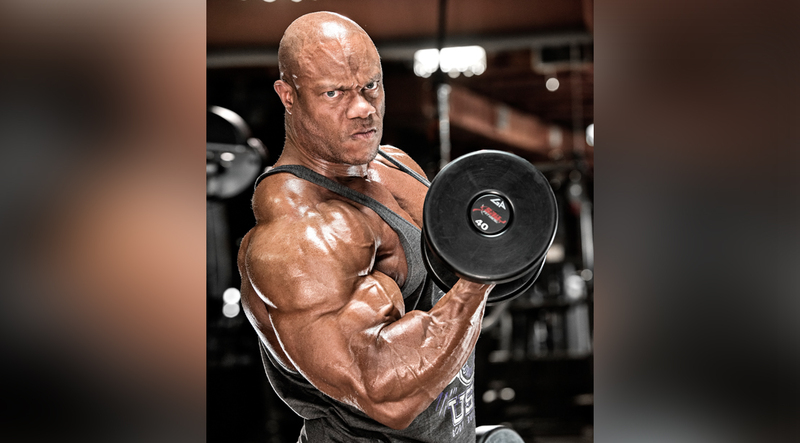 You’ll never be as massive as six-time Mr. O Phil Heath, but using his training methods can help you spur crazy growth while keeping an aesthetic physique. We spoke to Heath’s trainer, Hany Rambod, who also trained four-time Mr. O Jay Cutler and three-time Men’s Physique Olympia champ Jeremy Buendia. Here are the secrets he used to help build the best bodies in the industry. Despite being on the road for a week each month, Heath typically trains five to six days per week. He follows a traditional body-part split, working his chest, back, legs, shoulders, and arms on separate days. Abs are sprinkled in on random training days but are always worked first, according to Rambod. Time under tension—the amount of time that a muscle is under stress—is an important factor for muscle growth. More tension means more size. This is why leading up to the 2016 Mr. Olympia competition, Rambod had Heath implement static sets into his training. Heath would perform sets of one-arm lateral raises, holding the nonworking arm straight out at his side while the working side moves weight through the full range. This forced Heath to accumulate more TUT than he would if performing standard sets. Ladders sets, in which the lifter progressively increases his range of motion on an exercise after each rep, is another technique that Rambod used to increase Heath’s TUT. To do it, perform an exercise, like the barbell front raise, for half of the normal range of motion. After each rep, increase your range of motion by 3" to 4" until you reach the full range. “The goal is to push past the point of failure and to work different angles that his muscles aren’t used to,” explains Rambod. Rambod’s FST-7 system, in which the lifter performs seven sets of 10 to 12 reps with only 30 seconds of rest, stretches out the deep muscle fascia—a bundle of dense, fibrous connective tissue that surrounds the muscle—and increases the muscle’s room for growth. Using the method with isolation exercises better targets the muscle. Leading up to competition, Heath performs 30 minutes of either intervals or steady-state cardio in the morning, and then another 30-minute session in the afternoon. He usually sticks to the StairMaster and treadmill but will mix in battle ropes for a change of pace. Heath eats every three to four hours. He also weighs all his food, taking in 10oz of lean protein and 75g of carbs per meal. Heath takes branched-chain amino acids to prevent muscle fatigue and to promote protein synthesis throughout the day; glutamine helps keep him from becoming catabolic—losing muscle—while a pre-workout supp. featuring nitric oxide shuttles nutrients to his muscles by increasing blood flow. Immediately post-workout, he consumes a protein shake consisting of 75g of whey protein isolate. Because bodybuilders boast an unusual amount of muscle tissue, they are more susceptible to getting knots and accumulating a lot of scar tissue, which, over time, can impinge nerves and cause chronic pain. For this reason, Heath always foam rolls and stretches pre- and post-workout. But that’s not enough for the 280-lb mass monster. Heath also gets weekly deep-tissue massages, visits a chiropractor and acupuncturist, and uses electronic muscle stimulation to aid recovery. The goal is to reduce inflammation and improve blood circulation, which better prepares the body to deliver nutrients to muscles.